As you know I like a little baking foray every now and then. Easter is a very opportune time for this as a) I love Hot Cross Buns and b) every one of the little blighters here comes with a healthy dose of mixed peel (which I cannot eat being allergic to oranges). 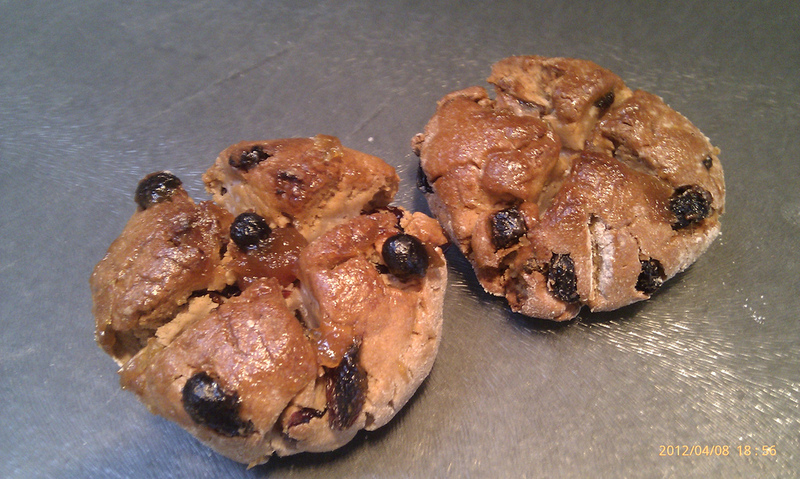 So as I started last year meaning to go on, it was time for Gidday’s Easter Buns. Buoyed in anticipation of lashings of butter on warm fruity buns, I weighed and mixed and kneaded and poked the fruit in. Waited an hour then formed my little parcels of Easter yumminess ready for the oven. But something didn’t feel right and I knew before I took them out of the oven (actually I knew before that but I was in denial) that there would be no light and fruity bundles scoffed at Gidday HQ today. So I spent 4 hours today making fruity – and inedible – rock cakes. This entry was posted in Expat moments, Life in the UK and tagged Easter, hot cross buns, Life in the UK, Sundays by Kym Hamer. Bookmark the permalink. Bugger indeed! BUT you could warm them up and slather them with butter and that would save them. They were really hard…like rocks. You may have needed dental work afterwards. On the plus side I could use them as deadly weapons should any more critters venture in? Gee thanks mate…the biggest downer was that they worked last year which was the first time I'd made them. Obviously the new Gidday HQ has some learning to do…. Poor you. What a shame. Better luck next time.